The sale and transfer of Atlanta's NHL franchise to Winnipeg means 'Peggers beloved Jets are returning to the ice this year. But if you're expecting a sneak preview at what their new sweaters will look like, you won't find it in NHL 12. Zack Cooper of Canada's Sportsnet Radio reported from Microsoft's X11 Canada Showcase that EA Sports doesn't expect Winnipeg's new threads to ship with the game. That will have to wait until its first roster update. A date for that was not specified, though it's possible one could arrive day-of-release, depending on when the team trots out its new look. Getting pinched by last-minute real world developments isn't new for EA Sports. Madden NFL 12 will have an outdated roster in its on-disc code, thanks to the NFL lockout postponing free agency and delaying training camp while the game was being finaled. But Madden will see a day-of-release title update that squares the file with reality as soon as gamers get home with their copy and connect to Xbox Live or PlayStation Network. It's possible NHL 12 will have the same thing ready, but Kotaku was unable to confirm this with an EA Sports representative at publication time. 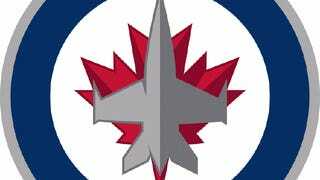 Though the Jets have revealed their new logo (pictured) the uniforms won't be shown until sometime in September. NHL 12 is on shelves Sept. 13—and will be available for a three-day full preview on Sept. 10 for those who bought the EA Sports Season Ticket membership. The NHL season commences Oct. 7. [Update 1:30 p.m. Aug. 20] An EA Sports representative confirms that the uniforms will not be on the disc, and has no announcement as to the time the sweaters will be available or when the game's first update will go out.